A bit like speed dating, just replace the Hunks and/or Hotties with general psych topics centered on self-delusion. The voicing is witty and casual and reads like a somewhat snarky friend who is done taking crap from his co-workers. Chapters are brief and feel more like blog entries than science writing, approaching their topics with sufficient information to communicate the colors and contours of each concept but never getting grittily into details. This makes the book great as a (VERY) quick survey of self-delusion for those who have a slight or budding interest, but less than great for those already familiar with the scientific treatment of self-delusions and who might be interested in a more in-depth treatment. Little to no effort is made to prove points, and much of the information is presented in a "well, just believe me" kind of casual style. 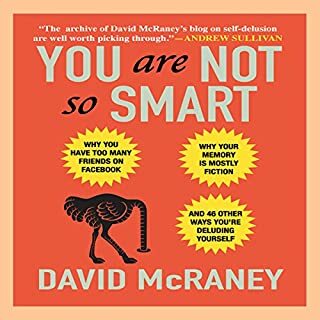 This is perhaps frustrating in light of the fact that ALL of the phenomena covered by the book are very well-evidenced in the psychology literature and are grounded on far firmer footing than McRaney makes them seem. With this considered, perhaps YOU ARE NOT SO SMART is best evaluated as Gateway Reading, with its merit lying more in pulling psychological phenomena into public awareness than in explaining or exploring them in any sordid detail. 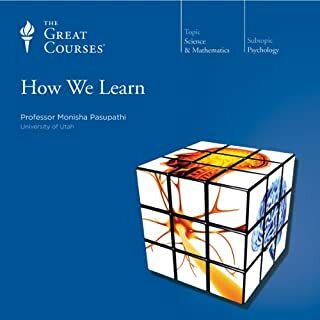 HOW WE LEARN is not a book (in the conventional sense) but rather a collection of 30 minute lectures provided by THE GREAT COURSES series and delivered by Monica Pasupathi. On balance, HOW WE LEARN, is an incredibly cogent synopsis of the scientific literature on human learning, from classical and operant conditioning through the validity of IQ measures and The Theory of Learning Styles. Dr. Pasupathi covers all included topics in a casual, engaging, but scientifically skillful way, calling attention to distinctions between causal and correlative relationships. There are some notable omissions from the course that (while understandable when considering the course's intended audience) fail to provide a complete picture of human learning. Virtually no lecture time is dedicated either to formal studies of human memory or recent discovers in neuroscience. These omissions were made presumably to simplify the lectures themselves and to reduce prerequisite knowledge needed to appreciate the course as a whole, but ultimately have the effect of simplifying a jigsaw puzzle by taking away some of the pieces: True there now are fewer bits to assemble, but the resulting picture will be left incomplete. Despite its omissions, however, HOW WE LEARN remains the best introduction to human learning that I have thus far had the good pleasure to encounter, and I recommend it heartily to everyone, scientists and layfolk alike. Dr. Pasupathi's delivery is charming, accessible, and delightful. However, there are times when her speech can feel a bit slow, and given the relative sparsity of concrete information, this can be occasionally frustrating. I recommend playing these lectures at accelerated speed (2x, 2.5x, or 3x if you can still follow) to improve the pacing of what are plainly top notch and marvelous lectures. I found this particular book somewhat difficult because of the vacillating nature of its quality. When its author is simply providing denotative descriptions of studies in neuroplasticity, he does so elegantly, engagingly, and cogently. However, when he extrapolates beyond the direct presentation of previous studies and enters the realm of his own speculation, he seems dangerously swayed by confirmation biases and, at times, completely unable or unwilling to consider alternative interpretations of the data. Additionally: much of the book reads as an uncritical, unsupportable love letter to Freud that the reader, with time, comes to suspect is the author's personal attempt to justify a counseling career spent practicing Freud's version of psychoanalysis despite mounting evidence that the vast majority of Freud's hypotheses have been shown to be demonstrably false. 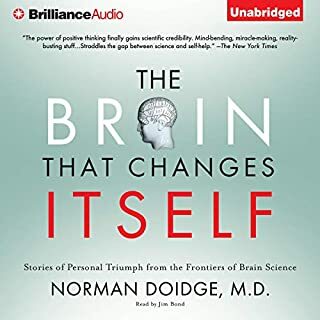 Indeed, the sections of THE BRAIN THAT CHANGES ITSELF that are most scientifically questionable are those in which Doidge steps away from neuroscience entirely to describe case studies of his own personal patients---studies in which he treats all of his perceptions and gut intuitions as incontrovertible facts. I feel the need to reiterate, however, that those parts of the book that share neurological studies are really very strongly worth reading. I might even be pressed to call them requisite reading for anyone interested in neuroplasticity--even those already versed in it. On the whole, this book is quite worth reading, though its overall quality varies. The good parts are marvelous, the bad parts are terrible, and there really isn't much in between. I do recommend it but only with the warning that heightened criticality and skepticism will be necessary to sort out the gold from the pyrite. Jim Bond is a wonderful narrator with a calming, avuncular voice and style, and for these qualities, he deserves high marks. However, it is evident from both his pronunciation and phrasing that many of the concepts broached and vocabulary used in this book were not familiar to him at the time of his reading, and therefore, pronunciations of common neuroscience words are strange and sometimes obfuscating (e.g. : Bond pronounces amygdala as "ah-mig-DAH-la", and his reading gets glassy when discussions get technical). Additionally, though not all folk will find this distracting, Bond has a rather pronounced whistle to his sibilant consonants, and has a high probability (estimated: 70%) of whistling on any given "S". I personally found this distracting, but not so terribly that I set aside the book. 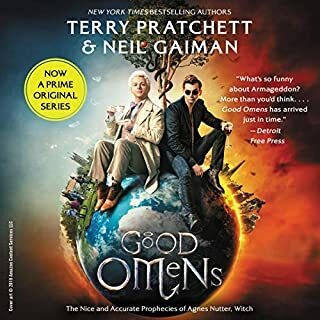 Good Omens is delightful fun. Pratchet and Gaimon are constant commedians in this N laughs per page irreverant comedy that pokes good fun at religion without ever insulting it. Whether you're a true believer or not, this book will set you smiling as you ride with the Four Bikers of the Apocalypse to a small English town where an eleven-year-old boy is trying to decide whether the world should end. There are witch-hunters, prophecies, angels, demons, aliens, Rhapsodies (the Bohemian sort), tunnels, a Bentley, evangalists, bookshops, Tibetans, water pistols, Satanic Nuns, and a small (but not too fluffly) dog. The best way to describe this book is that Douglas Adams would approve. If you're a fan of Hitchhiker's Guide style comedy, you'll want to give this delight a few reads. It is also worth noting that Mr. Martin Jarvis is astonishingly good at his job. So good, in fact, that I find myself wanting to hunt down other books he's narrated just so I can hear him talk on. His portrayal of moment by moment mood is near flawless. His bag of characters is assuredly endless, and his vocal quality is pristine. He deserves a definite shout out.